In honor of Women’s History month 2019, panelist spoke about their journey, motivation, and provided the audience with strategies to demand a seat at the table in the comedy and music industry. Jasmine managed logistics to host The North Face ambassador Alex Honnold on a segment of “Jimmy Kimmel Live” to promote his film Free Solo. The National Geographic's documentary following Alex 's rope-less ascent of Yosemite's El Capitan, grossed an impressive $300,804 in four theaters, the best screen-average opening ever for a documentary and also earned a 2019 Oscar nomination. As Manager of Rights and Partnerships, Jasmine led the PepsiCo Brisk and Sony Venom promotion. After the success of the Black Panther campaign, Brisk entrusted UEG to develop another impactful campaign including digital media, retail programs, a Fandango sweepstakes with special BTS content, radio promotions, and 15 regional screenings. Less than a month out from the release of the film, the team negotiated an additional influencer component with Lamaar Wilson, access to create a branded replica of the film’s Life Foundation laboratory, a mock symbiote (Brisk) canister mailed to select influencers, and plus ups at the world premiere including a two cocktails using the LTO Symbiotic Dark Cherry Limeade with Brisk branding on the menu as well as branded ice barrels with LTO product for consumers within the fan area of the red carpet. Assisted the United Entertainment Group Rights and Partnerships team executing a promotional partnership between PepsiCo’s Brisk and Disney’s Black Panther. The partnership included an exclusive influencer kit, custom character cans, consumer screenings, Walmart POS materials, Fandango Sweepstakes, :-6, :30, :60 digital spots, an All Star Weekend event, and the launch of Brisk’s Creators Class featuring a mentorship hosted by Michael B Jordan. 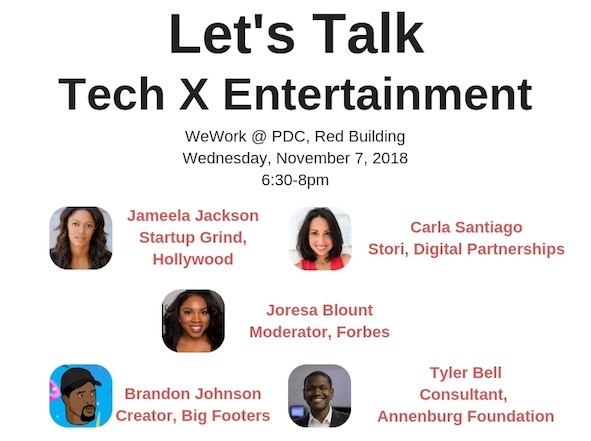 Jasmine Kent secured partnership with WeWork Pacific Design Center and organized panel to talk about the intersection of Tech and Entertainment with Joresa Blount (Forbes), Carla Santiago (United Entertainment Group, Tyler Bell (Annenberg Foundation), and Brandon Dean Johnson (Big Footers). As Entertainment Chair of Los Angeles Urban League Young Professionals, Jasmine secured panelist and worked with moderator, Mia Hall, to facilitate a conversation with Denise Davis (Insecure/ Color Creative), James Bland (Giants), Josh Burrell (Marvel), Ayanna Henderson (BPRS-LA), and Justin Key (Author, Entrepreneur/ Blavity) spoke about building a tribe and being resilient as a black creator and professional in Hollywood. As a freelance consultant, I worked with WOLF 1834 to develop a strategic digital campaign targeting males 24-35 with an affinity for luxury items.